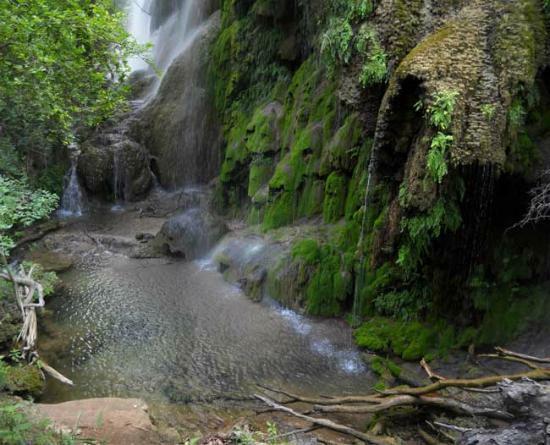 Gorman Falls is one of the Lone Star State’s best tucked away treasures — a hidden gem of a site. 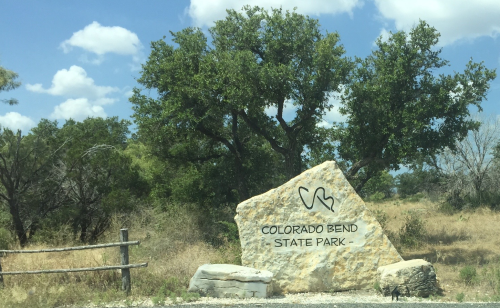 Located along a remote section of the Colorado River, the falls are a part of Colorado Bend State Park. Although the falls are located a little more than a mile from the trailhead, getting there requires a semi-strenuous hike along a rugged but scenic trail. The last hundred yards of the trail require cautiously working your way down a steep descent along slick outcroppings of rock. You will hear the sound of the water as you make your final approach. The park service has placed cables along this final section of the trail to give hikers a handhold along the steep descent to the base of the falls. The final steps of the hike lead down to a heavily shaded bluff at the base of the falls next to the Colorado River. There is a nice seating area there, something akin to a pew in this heavily shaded area that feels like a beautiful outdoor cathedral. This is a relaxing spot to sit and enjoy the sound of the falls under the shade of the trees. Gorman Falls are fed by Gorman Springs. Cascading down from a 60-foot high limestone cliff, the calcium deposits in the water have created what look like window drapes. These formations are covered with green moss and ferns, adding a calming beauty to the picturesque scene. The park service has restricted access to the base of the falls to help protect the area from damage, so don’t expect to take a dip there. According to my hiking app, my round-trip hike to Gorman Falls from the trailhead was 3.2 miles. There is little shade along the trail so you might want to wear a ball cap. Although this is not a long hike, don’t make the mistake of hiking in poor shoes or flip-flops or it will definitely feel like a much longer hike. And be sure to take plenty of water to stay hydrated. When you finally arrive at the falls, you’ll agree that hiking to Gorman Falls is definitely worth every step that it takes to get there. 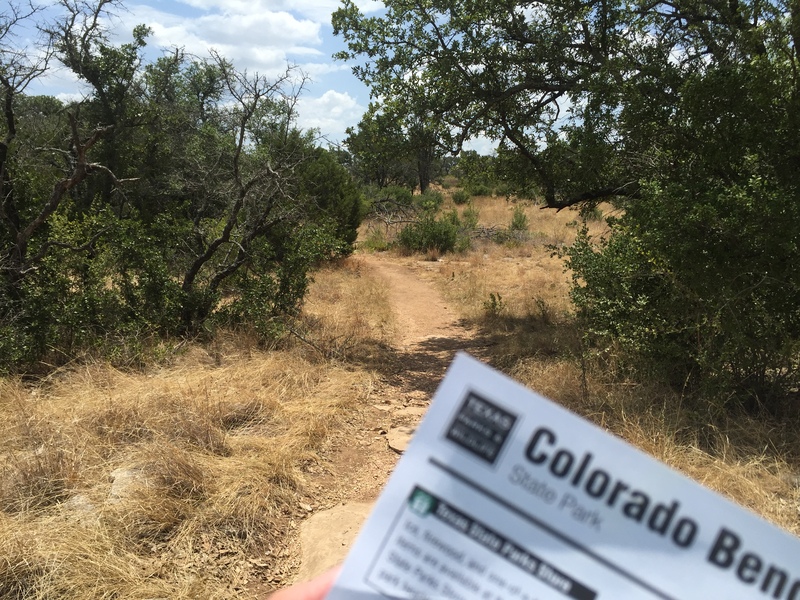 This entry was posted in Texas State Parks and tagged Colorado Bend State Park, Gorman Falls. Bookmark the permalink. 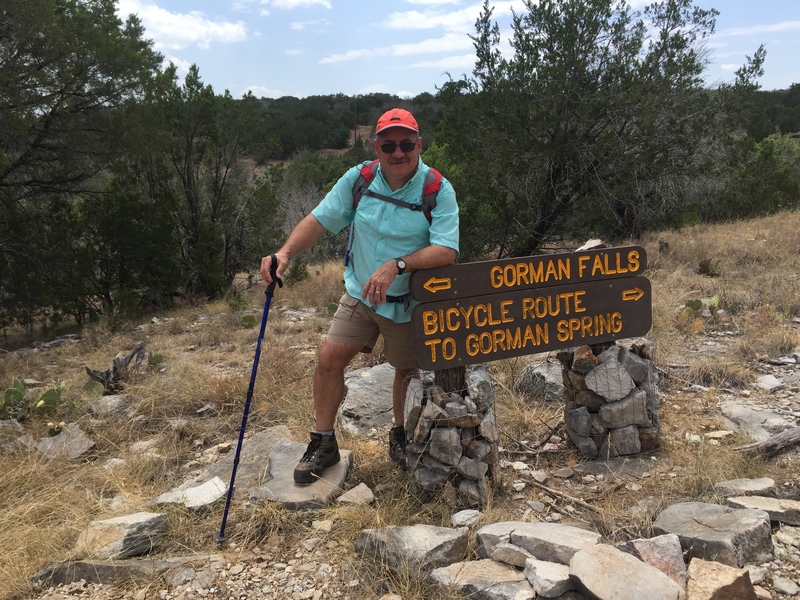 I think I’m going to put Gorman Falls on my list of places to visit…what a beautiful place to visit, once you’re past the rocky path! You’ll love it. Very peaceful and beautiful place. Enjoy a relaxing time in the shade once you get there.